Tomorrow is the start of 30 consecutive days of posting for National Blog Posting Month, and I'm using it to jump-start this blog and my art. You can randomly visit participating blogs through the Randomizer. Let the rollercoaster thrills begin. I experimented with a little diptych today, and learned something in the process. I painted both halves on the same sheet of paper separated by a four inch margin, and ended up having a hard time getting things to line up. Duh. So far this weekend has been entirely unproductive as I psych myself out about whether my art is marketable. I'd like to enter some pieces in the small art competition, but my art is sooo conventional that I can't imagine they'd be of interest in a hipster wannabe enclave like DC. Not that there's anything wrong with being a hipster wannabe. My work used to be quirky, but that fell off the back of the truck in my 30s. Yesterday I went out to the "Dig" opening at H&F Fine Arts, as promoted by J.T. 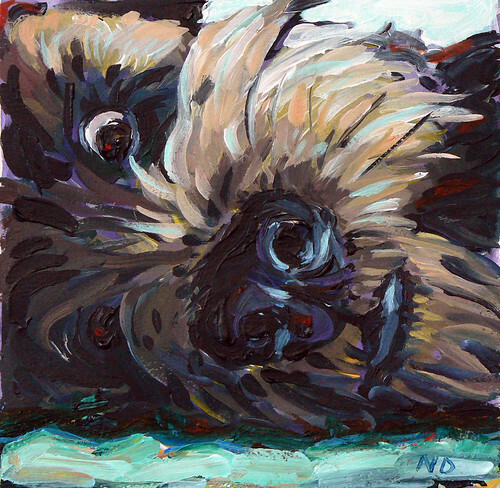 Kirkland over at the Thinking About Art blog and curated by Fallon and Rosof from works of Phillie artists. I like the idea of a local mid-Atlantic art scene between Philadelphia, Baltimore, and DC, because it seems more approachable than the big NYC extravaganza. I had aspirations of introducing myself to all these bloggers of whom I had read, but I got cold feet and ended up just lurking around for a while looking at the art. Plus I couldn't tell who was who. I'm not really sure the Phillie crowd made it-- I overheard someone mentioning how lost visitors were. H&F is a nice space, but it is a little off the beaten track in a transitional suburban neighborhood. The work was an interesting variety, but totalled only about 15 or 20 pieces-- a couple of pieces each for the six or seven artists. How can I possibly fit into a scene like this? Because I don't see myself fitting in to the glicee-reproductions-of-my-landscapes scene either. Tortured misunderstood artist, that's me. 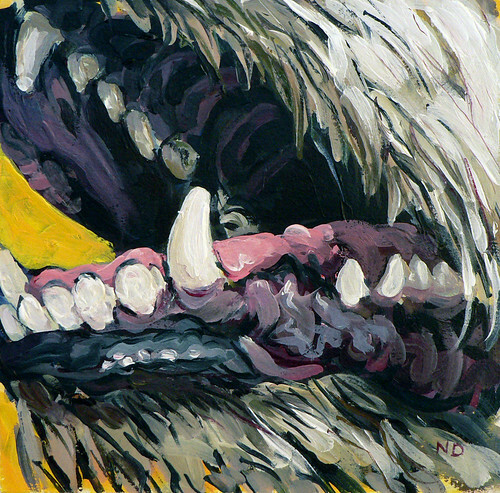 While trawling around the artdc.org site, I came across this local juried competition for small art. So, let me think about this for a sec. I've got to fill an art blog every day in November for Nablopomo, I'm trying to get my artistic production on track, and they are having a show for small works with a deadline in December. Nope, I'm not seeing a connection. Maintaining the appropriate artistic persona is a nuisance. I've got a sense of humor, really, but it doesn't seem appropriate to exercise it anywhere in proximity to my hallowed works. After all, I'm not painting jack-in-the-boxes (jacks-in-the-box?) and cartoon wabbits. I do staid landscapes, so I need to seem earnest and thoughtful. I remember back in grad school a woman who did these mournful, grim prints-- she was a total giggling dingbat. For all I know she was masking a miserable childhood, but I could never reconcile her work with her persona. It's a shame, because accommodating expectations that your disposition should exactly mirror your artwork feels like a trap. I've signed up this blog for Nablopomo 2007-- National Blog Posting Month. As the quote says: "Post every day for the month of November. That's all you have to do." Loosen up. So far this blog is as boring as an artist's statement. I need to figure out some way to set free my snarky self without surrendering the thin veneer of dignity needed to seem a credible artist. Learn about selling art. I've ordered a pile of books on marketing art and hope to spend some time examining other resources. Not that I aspire to being a soulless entrepreneur; believe me I'd rather just make stuff. But I need to stoke a little fire in my belly about business if I don't want to have a houseful of undiscovered paintings leaning against every wall. Relearn old lessons. 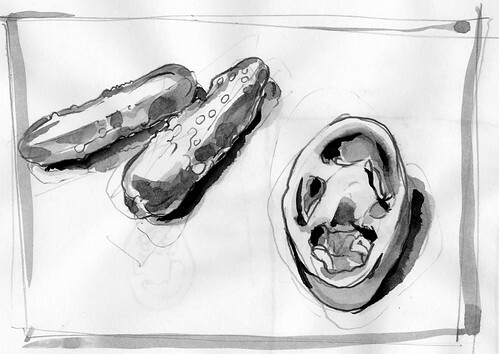 Although it seems a little undignified to be going back to art school drawing exercises, it's stupid for me not to. Though I've learned a lot over the past 20 years, I certainly don't draw as well as I once did. Plus cranking out a few sketches would be great material for daily posts. Get into a routine of painting or drawing every day. This is a painting I finished this weekend. At least I think it's finished-- but the house in the background is awfully bright. I haven't done more than a handful of contour drawings in the last twenty years, and it shows in the fiddly lines all over the place. My freshman drawing teacher wouldn't be impressed, but I'm encouraged. 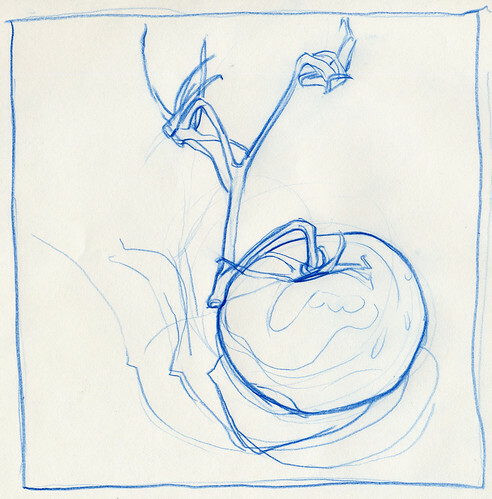 Sketching is such a great opportunity to really see that a tomato isn't really round. 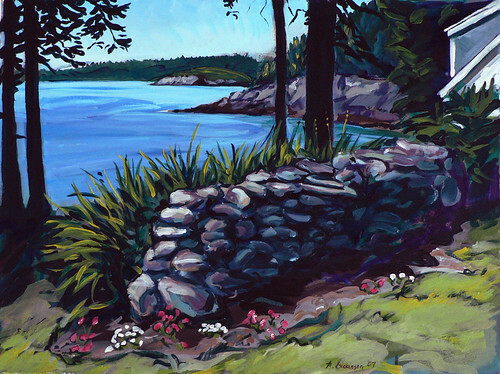 At times focusing on Deer Isle landscape as a subject for my paintings seems limiting. When I'm up there it makes perfect sense, because it's a wonderful lifestyle, everything is so beautiful, and I feel lucky to be in the midsts of it all. When I am away it is comforting to make these paintings, and it reminds me of how fortunate I am, but it's not really the same thing. Sticking with Deer Isle subjects has the benefit of giving me quick focus when I settle down to work and provides consistency to the pieces, but I can't help feeling I ought to be working with something more immediate. The landscape around Washington, DC is often lovely but isn't terribly dramatic or singular-- lotta rolling hills, lotta green. We have the monuments, which are too loaded with patriotic zeal as subject matter. We have the Chesapeake Bay nearby, which is pretty but fairly marshy and horizontal. I like scenes that take my breath away with precipitous dropoffs, or massive brooding rock formations. I used to love the quarries around Bloomington, Indiana in grad school. When I think about nearby subjects that really strike a chord in me, I have always had an attraction to the bridges, particularly those spanning Rock Creek Park. One rides atop them on a constant basis without giving it a thought, but when you peer off the side or stand underneath these monsters they evoke the grandeur of Roman acqueducts and Piranesi prints (I was a printmaker in school, so Piranesi's prisons were a staple). They are our stealth monuments. And what kind of effort went into building these bridges? I remember looking at a plaque on one of the bridges, maybe the P Street Bridge, mentioning that it was rebuilt by the WPA. The Roosevelt era recovery efforts are so romantic. Though the reality of those times was certainly not so simple, it's hard not to bask in the rosy glow of the benevolent ideals I was taught about in elementary school. I need to scout a few bridges. Just so long as no one ever accuses me of painting them as an allegory for my transition from something to something else. Eek. After barely a week I decided I wasn't all that excited about this blog's design. I wanted a cleaner look that I could integrate better with a separate home page, so I pulled apart one of the Blogger templates, bumbled my way through CSS, and studied a beautifully simple design by Andreas Viklund. After seeing the fruit of my efforts, I feel so, so... eh, it's kind of dull. I'll keep working at it. I came across a provocative article about art communities on the internet. To paraphrase, the author tars Facebook and similar social networking sites as a time sink for artists actually trying to sell work. A better marketing opportunity is a personal art site with a small community of visitors more expressly interested in your work. I seem to have stumbled into his idea of a decent approach, if I ever decide I'm actually trying to sell anything. For now I'm happy if I can just get into the routine of thinking about and making art.